View More In Plant Cages & Supports. 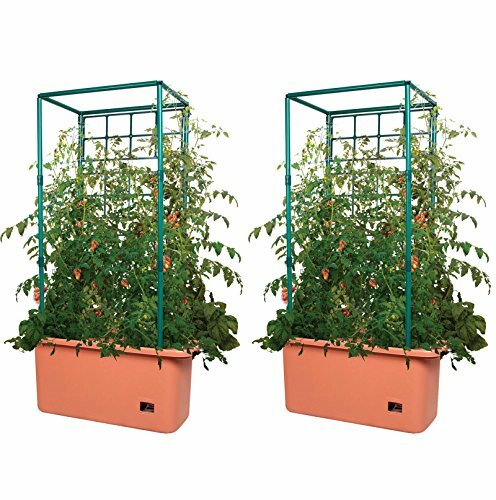 Package Includes: (2) Hydrofarm Tomato Trellis Systems\n----------\nThe Hydrofarm Tomato Trellis System is a perfect fit for your garden. Hydrofarm's self-watering planters provide lightweight, strong support for tomatoes, beans, peas and other climbing plants and flowers. An easy-to-fill reservoir system delivers water and nutrients from below, helping avoid over- or underwatering. The Hydrofarm Tomato Trellis System features a sturdy frame construction that helps support the weight of the vines as they grow, allowing the plant to devote more energy to developing fruit - and preventing the fruit from falling off before it's ripe. If you have any questions about this product by Hydrofarm, contact us by completing and submitting the form below. If you are looking for a specif part number, please include it with your message.